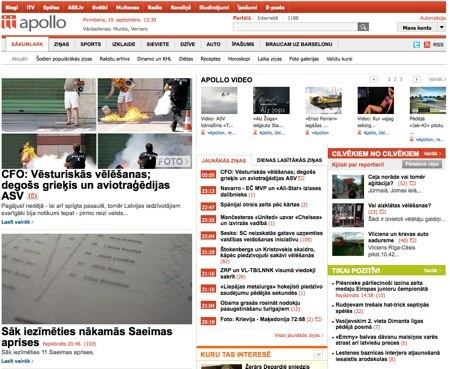 Finnish newspaper and online publisher Sanoma News has acquired Latvia’s second-largest online news service, Apollo, from SIA Lattelecom BPO. Apollo.lv has 450,000 unique visitors a month and is the 10th most popular site in Latvia according to Alexa. The site is said to make €500,000 (US$683,000) a year in net sales. “I am convinced that Sanoma, as significant European media player, is the optimal owner for Apollo. Sanoma’s competence enables considerable development of the Apollo news service in regard to content and media sales,” says Juris Gulbis, CEO of SIA Lattelecom. Sanoma News is a leading media group in the Nordic countries with operations in 20 European countries, based in Helsinki. A long with Finland, the company has a presence in Belgium, Bulgaria, Croatia, the Czech Republic, Denmark, Estonia, Hungary, Latvia, Lithuania, the Netherlands, Romania, Russia, Serbia, Slovakia, Slovenia and Ukraine.